The Bushnell Elite Tactical LTRS 3-12x 44mm is a great scope option for the money. It offers a variable 3-12x magnification range allowing for shot placements from short to long range. Some of its features include a Revlimiter Zero Stop, side parallax adjustment, fully multi-coated optics, RainGuard HD and target turrets. This scope also comes with Bushnell’s lifetime, no questions asked Bulletproof Guarantee. All of these features come together to create a scope that will grant you the ability to hit your targets with accuracy and efficiently while providing a great dollar to value ratio. 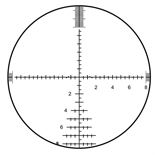 To use a riflescope with your firearm, you’ll need a mounting base and mounting rings in addition to the scope itself. Bases attach to your firearm and the rings attach your scope to the base. Proper spacing of the rings, as well as the ring height should be considered to ensure a proper line of sight can be established. This will maximize the value of your investment, and enhance your shooting experience. It should be noted that in many mounting applications, a professional gunsmith’s skills will be needed for proper installation.